Open OTEC systems involve taking water from deeper ocean depths and bringing it to the surface to create a thermal energy difference and generate electricity. The colder deep water is discharged close to the surface, along with nutrients, increased salinity, and different dissolved gas concentration (USA Commerce). This changes the stratification of ocean characteristics established in open water and could have several effects on wildlife. Changing the water conditions at the surface could prevent organisms that have adapted to the specific conditions of temperature or salinity from habiting the area (Abbasi and Abbasi). Also, moving nutrients to the surface waters could stimulate increased production and biodiversity, but could also stimulate algal blooms that lead to eutrophication. Eutrophication is increased biological oxygen demand due to increased primary production from excess nutrients in the water. 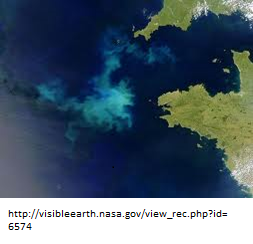 Eutrophication leads to hypoxic conditions that prevent any organisms from surviving in the area (Gray). These effects could be mitigated by employing a closed OTEC system that recycles used fluid or by collecting the product of the OTEC system and using it onshore. Deep water often contains higher concentrations of heavy metals, which could bioaccumulate in fish near the surface waters if the water was mixed (Fast). Lastly, deep water with surface water would release some of the dissolved carbon dioxide that is stored closer to the ocean floor, increasing the carbon footprint of the project (Pelc and Fujita). How can I sign up for your articles by email? I’m keen on getting new articles delivered right to my email if it is possible; keeps me from having to check over 3 dozen different blogs every day, is this possible? I found this article to be very effective in providing a comprehensive overview of how OTEC processes have the potential to change water column dynamics. However, I feel that this article could have been improved by expounding on specific ecological concepts that were briefly introduced, such as more explicit references to the effects OTEC has on wildlife. Moreover, I feel that it would have made this article all the more poignant if the author related the cascading effects of ecological degradation within the water column back to human health and society. The environmental issues introduced in the article represent the potential problems for fish species and human society, depending on the proximity of OTEC systems to the coastline and/or ocean currents that reach the coastline. As mentioned, eutrophication prevents aquatic life from thriving. In particular, eutrophication could kill various fish species that also represent a vital resource for the fishing industry, which generates substantial revenue for coastal communities in the United States. The article then proposes a solution, and ends with a discussion of heavy metal mixing as a consequence of OTEC system. This flaw in organization does not explicitly define which system, open or closed, causes the increased prevalence of heavy metals. Nonetheless, exposure to heavy metals cites potentially negative effects for human health. Recent research has concluded that heavy metals, particularly cadmium, lead, and mercury, are endocrine inhibitors that disrupt natural hormonal processes in the development of the human reproductive system. (Wirth and Mijal.) This is especially worrisome for young men who are particularly vulnerable during specific stages of reproductive development. If these OTEC systems increase human exposure to heavy metals, juvenile development in young men could be severely threatened. The author introduced numerous issues associated with open OTEC systems, and in turn proposed using closed OTEC systems to mitigate environmental degradation. Although, many of the environmental concerns corresponding with open OTEC systems can be cited or even aggravated by closed OTEC systems. 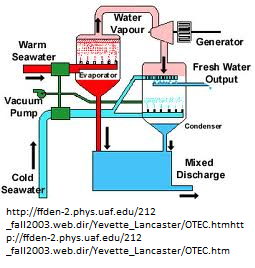 When explaining closed OTEC processes, the author briefly notes that an unnamed “fluid” is heated and cooled which creates energy used onshore. The author fails to mention that the fluid often employed is ammonia, a compound that is highly noxious when released into the environment. The ammonia used in closed OTEC systems could be subject to leaks or spills. If such is the case, ammonia exposure is extremely toxic to fish (Boehlert and Gill.) The consequences could cite detrimental effects for fish populations, and subsequently the fishing industry, which could exacerbate the previously mentioned issues. With slightly more research, this article could more successfully communicate the full effects OTEC systems have on water column chemistry and, moreover, how such will affects society. Wirth, J., & Mijal, R. (2010). Adverse effects of low level heavy metal exposure on male reproductive function. System Biology in Reproductive Medicine , 56(2), 147–67. Boehlert, G. W., & Gill , A. B. (2010). Environmental and Ecological Effects of Ocean Renewable Energy Development. Oceanography, 23(2), 68–81.